I wonder how I can add a class to the form tag (of the _search_content_ view's) exposed form using template_preprocess_views_exposed_form() (or even better template_preprocess_views_exposed_form__search_content()). The form is exposed as block. // and also manipulating $variables['form'], but this didn't work either. The function gets called, but it's not adding the class to the form tag. Is it possible to get it work with template_preprocess_views_exposed_form()? Is it possible to get it work with template_preprocess_views_exposed_form()? Short version: You cannot use hook_preprocess_views_exposed_form() to modify the <form> tag. The <form> tag is independently rendered by a form theme hook set through the #theme_wrappers render property. Which means that it is completely disassociated from the actual views_exposed_form theme hook that renders the (internal) content of the views exposed form. #theme => views_exposed_form (and other more specific ones like views_exposed_form__search_content): This is the theme hook that will provide the content of the form, i.e. everything inside the <form> tag. 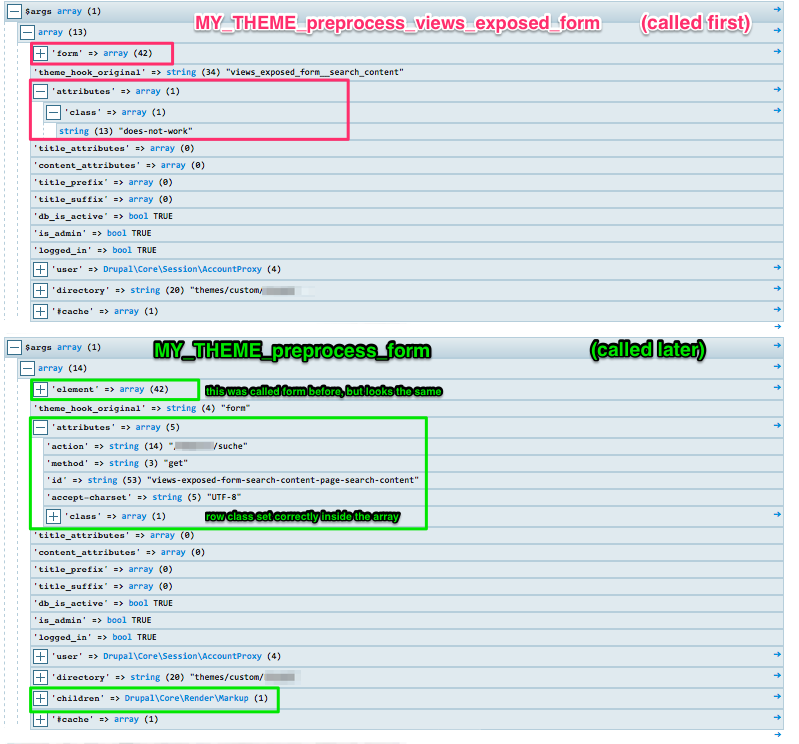 This is what you get access to and given the option to modify when calling template_preprocess_views_exposed_form(). This theme hook is not responsible for rendering the <form> tag and does not allow you to change it. #theme_wrappers => ['form'] : This is the #theme_wrappers list of theme hooks; form will provide the actual <form> tag. It will essentially enclose the markup generated by the #theme theme hook into a <form> tag. This is what you get access to when calling template_preprocess_form(). This theme is responsible for rendering the <form> tag and does allow you to change it. If you would rather let hook_form_alter() implementations handle form-related logic, you could still use another preprocess hook to implement the functionality you want, namely the preprocess_views_view() hook. Good luck, this is a really good question! The views exposed form preprocess function does not edit the form itself because this is a different hook. The proper way to add a class to the form is to alter the form it self or use https://api.drupal.org/api/drupal/core%21includes%21form.inc/function/template_preprocess_form/8.6.x because this function is the responsible for adding attributes to the form itself. Also check the twig source of https://api.drupal.org/api/drupal/core%21themes%21stable%21templates%21form%21form.html.twig/8.6.x You'll see that the attributes are printed there. How to use AJAX for an exposed filter form of a Views block? How do I get at the raw file name of a File entity in a Twig field override?